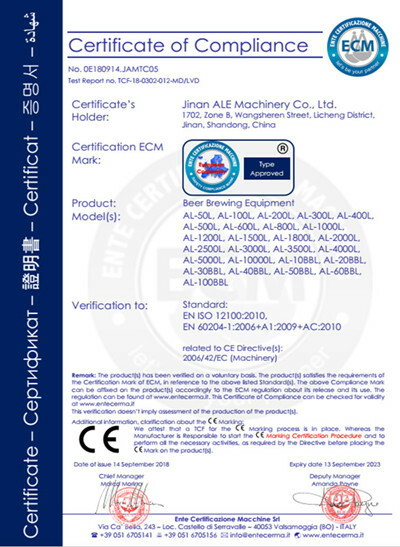 Company Overview - Jinan ALE Machinery Co., Ltd.
1YRSJinan ALE Machinery Co., Ltd.
Jinan ALE Machinery Co., Ltd locates in Jinan city, Shandong Province, which is mainly engaged in the process design, equipment manufacturing and engineering installation services of beer, fruit wine and other brewing systems.The company has been certificated by CE,ISO and ISO, also could meet customers' request for UL, CSA, ASME, AS 1210, NZS 1200. With more than 15 years developing, ALE product is highly recognized by clients from more than 20 countries. The company has industry-leading design, sales, soldering, and installation teams. The factory covers an area of more than 3,000 m2, and has automatic welding equipment, large automatic polishing, laser automatic cutting, spinning equipment, automatic welding equipment, CNC lathes, milling machines, shearing machines, bending machines and other high-end manufacturing equipment. It can independently complete the metal stamping, cutting, bending, coiling, welding, heat treatment, non-destructive testing and other processes. Our scope of delivery includes all aspects of the individual brewery plant including the layout of the brewery on CAD, the assembly of the plant at place, the preparation for equipment & pipelines and so on , the development of special beer recipes for beer production and training of personnel on-site by our brew-masters. Our long-term established relationships with the best producers in this field enable us to guarantee a consistent and reliable supply of brewery equipment of highest quality, which is an essential ingredient in brewing top class beer! And also this is important to us: Besides most advanced technologies and exquisite quality, professional project management and execution a constructive dialogue with our customers is one of the requirements for the smooth realization of a brewery, the basis for your success. And only the success of our customers can be our success!